Unlike Gradebook which posts and manages grades, the Post’Em tool only displays them. Changes to grades are made offline on a spreadsheet, which may work well for some. Tools cannot send scores to it as is possible with Gradebook. Post’Em works off of a spreadsheet that is uploaded in .csv format, which is a specially formatted text file that can be read by spreadsheet applications like Excel. 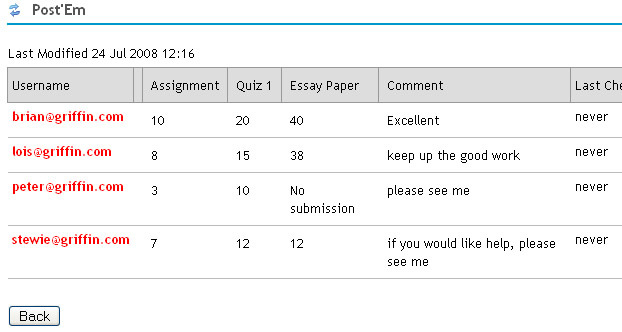 The advantage of this is that grade items and weighting can be customized and can include comments and other text. With the Gradebook, the items are listed alphabetically or by date depending on your view settings, and entries are limited to numeric and letter grades. On the other hand, Post’Em offers more control over how grades are presented. *Note: The Post’em tool is not a default tool and will need to be added to your course. To find out how to add tools in Laulima, click here. How do I post grades using Post’Em? Begin by setting up your spreadsheet as shown below. The first row must list headers across the top. The first column should list the UH usernames of all your students in the course. This is how Post’Em links the corresponding information along the row to a particular student. *Note: A .csv file can be exported out of the Gradebook tool with the list of students’/participants’ UH usernames. This can save time by not having to type in all the UH usernames, especially for large classes. To see how this is done, click here. After arranging the grades and/or comments on the spreadsheet, save it as a .csv file. A .csv file is a comma delimited file format. The spreadsheet needs to be in this format so Laulima can process it. On the "Save As" window, click the drop-down menu and select "CSV (Comma delimited) (*.csv)" then save the file. The .csv file can now be uploaded to Post’Em. To do so, go into your course space in Laulima and open the Post’Em tool then click the "Add" link. Enter a title for the .csv file that you are about to upload then click the "Browse" button to locate the .csv file on your computer. 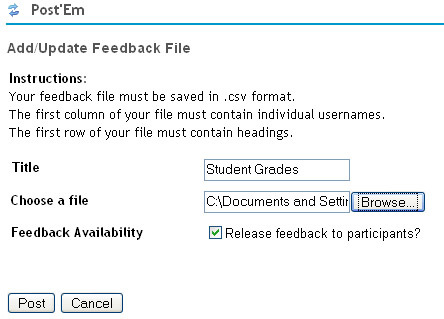 If you want the students/participants to view the grades/comments as soon as the file is uploaded, make sure the box for "Release feedback to participants?" is checked. If you want to release the information at a later date, you can uncheck the box. Click the "Post" button. The students’ usernames will appear in red, indicating that they have not checked on their feedback yet.